This was a very interesting week in matters green. I received a report from Taiwan that Chinese silicon based PV cells with 16.2% efficiency are now selling for 25 US cents a watt. When Solyndra was still on life support about two years ago their target at full production was to get to one dollar per watt. The Chinese companies from the raw polysilicon starting material through the fully fabricated PV cell are operating without any profit and just selling their products for their cash production costs to keep the employees busy. The countries that import the cells are basically getting a gift. What does 16.2% efficiency mean? It means that 16.2% of the energy in the incident solar radiation becomes electricity. This is actually pretty remarkable when compared to photosynthesis and plant growth where only approximately 0.1% to 0.2% of the incident solar radiation actually becomes BTUs in the biomass. The 0.2% is for locations like brazil and sugar cane as a crop and the 0.1% would be for a location like the UK with wheat as the crop. Vehicle sales in the USA were strong in November and the Chev Volt experienced decreased sales after the heavy rebates and price discounting ended in October. The Nissan Leaf had slightly weaker sales in November than October even though they instituted large rebates and discounts. The plug in Prius also had large rebates and discounts and yet sales were also slightly lower in November. With all of the rebating and discounting plug in vehicle sales were approximately 6,500 vehicles out of the approximately 1.14 million sold in the USA during the month. The department of entropy will claim this is a very successful program as the plug-ins may reach a total of 50,000 vehicles sold for the full year. 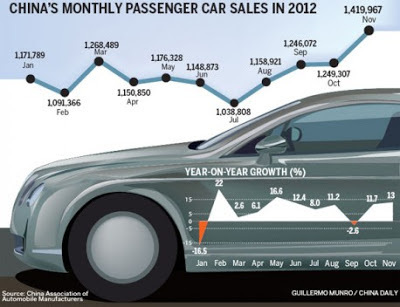 As a footnote China sold 1.42 million vehicles in November and did not report the electric vehicle sales. The department of entropy issued their 2013 forecast of projected energy usage in the USA through the year 2040. They now forecast that the USA will be emitting 5% less CO2 in each and every year till 2040 than we did in 2005. The 2006 forecast that went through 2025 had the US on a path to almost double CO2 emissions by 2025. What a difference a few years makes in how we forecast the future. I agree with the latest DOE forecast that we can actually grow the economy and not increase our CO2 emissions. Unfortunately China , India, and other developing economies will continue to increase their emissions. There are negotiations in Doha to try herd the member countries of the UN to agree to limits in carbon emissions. The famous Kyoto accord is coming to an end soon and a new accord is needed. Three years back President Obama, committed the western countries to give the developing countries $100 billion in aid for reducing carbon emissions. That is not going to happen and the developing countries want little or no part of a new Kyoto protocol, but 15 years after Kyoto their emissions now eclipse those of the developed economies. I still think the best idea is to peg the annual dues a country pays to the UN in direct proportion to their carbon emissions of the previous year. Carbon credits in Europe traded as low as $7 per short ton this week. The cost of gasoline is down in Northern California. I paid $3.75 a gallon versus $4.95 a gallon at its peak two months ago at the very same gas station. The new name for the developed economies should be the declining economies and the new name for developing economies should be the inclining economies. Perhaps by using these terms we could reach agreement on how to tackle global carbon emissions. It is not nice to be called undeveloped it is much more correct to be called inclining. The western economies are no longer developed they are declining. The question is simply how rapidly and how far they decline. I shall simply decline to answer this question. The renminbi should be revalued. Recommend castration for eating rhinoceros horn. Seems like China would make the UN very rich, if your idea were to be instituted. Les no doubt China should pay much more as dues to support the world body. They are 20% of the world population and now 28% of world CO2 emissions. Also countries like The United Arab Emirates would pay a lot more to be in the UN as these oil rich countries have massive per capita CO2 emissions. A country like Swaziland would get a good deal on its membership. The French would be happy as they generate much of their power with nuclear stations. South Africa and Saudi Arabia each emit more CO2 than does France. I may have to call Mr. Moon and tell him of the idea that I am sure he will like as it brings him more money to waste.